An abundance of good food is just one of the things that makes the South Tyrol a delight to explore by foot. Ask any chef of the region why the food is so tasty and they’ll usually tell you that it’s a result of delicious, good quality, local ingredients. One of the ingredients that often finds its way into South Tyrolean cuisine is the apple. Apples grow in profusion in the South Tyrol, and they’re distinctive. They’re so distinctive, in fact, that they bear a special seal of authenticity, South Tyrolean Apple PGI, known throughout the entire European Union. In short, apples are ubiquitous in this region, and you find them in Apfelstrudel, you taste them in Apfelschmarren, and you delight in their refreshing sweetness in one of my favorite drinks, Apfelschorle. 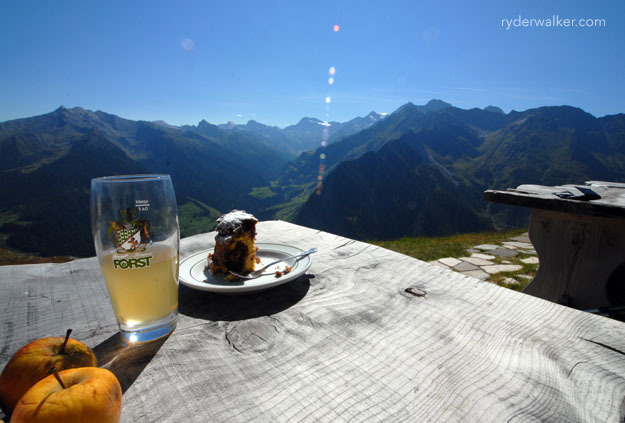 Apfelschorle is the perfect drink for a hiker. It’s refreshing. It’s delicious, and it’s extremely easy to make. Schorle is the German word for any beverage that consists of fruit juice diluted with lightly carbonated water. Mix a general fruit juice with sparkling mineral water and it’s called a Fruchtschorle. Mix apple juice with sparkling water and it’s called an Apfelschorle. Apfelschorle is less sweet and contains fewer calories than pure apple juice, making it extremely popular with hikers and athletes during the summer. The drink is extremely popular in Germany and commercial varieties abound, though they’re usually artificially sweetened and contain minimal juice. If you have the opportunity to hike through the Südtirol, then order an Apfelschorle mixed with locally-produced apple juice. It’s the only way to go. Can’t make it to northern Italy? Try mixing your own at home. Find a good quality apple juice, (preferably local and freshly squeezed), and cut it with sparkling mineral water. A 50/50 ratio is pretty standard but always adjust to taste. Salute! Image: A nice break from hiking. Apfelschorle, homemade cake and big mountain views.